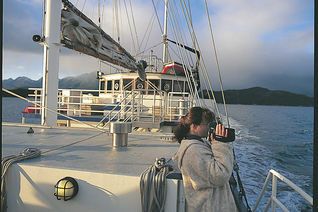 From Manapouri enjoy all the highlights of the Dusky Sound Discovery Cruise and then travel further south to Chalky and Preservation Inlets. This cruise includes a spectacular one-way scenic helicopter flight between Lake Manapouri and Preservation Inlet to increase our exploration time. 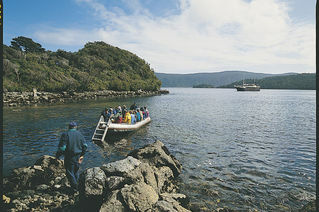 The wind-swept coastlines and grand sweeping beaches of New Zealand’s southernmost fiords are remote and seldom visited. 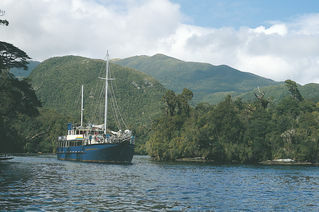 In the past, the natural harbours in this area attracted early whalers and miners. Only a few traces of their attempts to tame the landscape still remain. Just because you’re escaping civilisation doesn’t mean you have to go without its comforts. The Milford Wanderer is a modern motorised vessel that has been purpose built for navigating southern New Zealand. The cruises attract people of all ages. All you need is an average level of fitness, a love of the outdoors and a sense of adventure. As a rough guide, you need to be physically fit enough to comfortably climb a flight of steep stairs. Dates: May, 6,12,27. June 2. July 22,28.